Today the Federal Reserve Open Market Committee (FOMC) will almost surely announce it is continuing on its path of steady interest rate hikes. These hikes are meant to start slowing the growth of the U.S. economy in the name of getting ahead of the curve on any potential outbreak of inflation. It’s important to be really clear on this point. The Fed is trying to keep economic growth slower than it would have otherwise been, and unemployment higher than it would otherwise have been, if they had not raised rates. Intentionally keeping unemployment higher than it would have been will strike many as hard to believe—why would the Fed ever do this? The reason is that they see their job as balancing the obvious (but still underappreciated) benefits of low unemployment against the risk that unemployment will get so low that workers are empowered to achieve wage increases so large that they threaten to push up inflation. They’re not wrong that falling unemployment would eventually lead to faster wage growth. A primary way that workers (especially nonunionized workers) get raises is by either leaving their current job for a better one, or threatening to leave if their bosses don’t give them a raise. When unemployment is higher, fewer better-paying jobs are out there for workers to move to, and bosses know this and don’t find threats to leave all that credible. 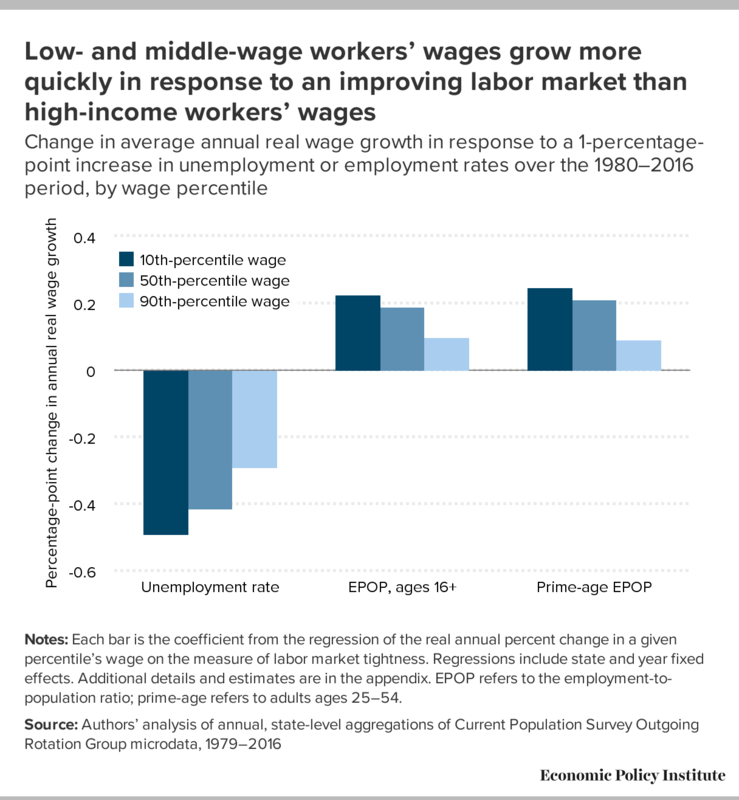 This intuition is confirmed by data—lower unemployment is clearly associated with faster wage growth, and this effect is most pronounced for low- and moderate-wage workers with few other sources of leverage in the labor market to get raises. Defenders of the Fed’s current path would say that it makes sense when judged by the past history of the Fed—unemployment today sits below 4 percent, well below conventional estimates of the “natural” rate of unemployment that is meant to define the lowest sustainable rate of non-inflationary unemployment. But the history of the Fed is wrong benchmark here, for a couple of reasons. 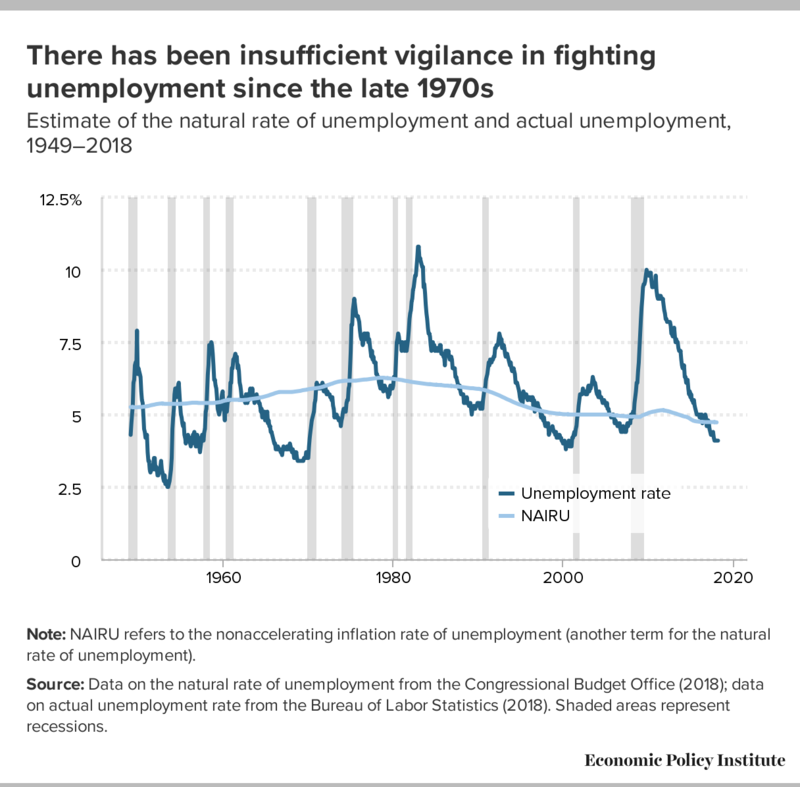 First, this history includes decades-long stretches when the Fed tolerated excess unemployment even compared to official (and likely too-conservative) measures of the natural rate of unemployment. These prolonged periods of deliberate labor market slack were totally corrosive to the ability of most American workers to see wage gains. A decade after the last financial crisis and recession, the U.S. economy remains significantly smaller than it should be based on its pre-crisis growth trend. One possible reason lies in the large losses in the economy’s productive capacity following the financial crisis. The size of those losses suggests that the level of output is unlikely to revert to its pre-crisis trend level. This represents a lifetime present-value income loss of about $70,000 for every American. It is widely acknowledged that this loss to the economy’s underlying productive potential identified by the San Francisco Fed was likely driven (at least in part) by the prolonged period of economic slack following the Great Recession. As firms could serve all the customers coming in their door with existing capacity, there was little need to invest in more. And as workers were made cheap as high unemployment bludgeoned their ability to achieve raises, there was little need for firms to make labor-saving investments. But if a long period of economic slack can damage the economy’s productive capacity, it certainly seems worth seeing if a long period of high pressure (particularly labor markets) can help claw back some of this lost capacity. It’s an idea with a pedigree, and there certainly is some preliminary evidence that it might be true. Most importantly, the potential payoff is enormous. The objection to this view is that “going for growth” by allowing the economy to run forward unimpeded by interest rate hikes comes with risks as well. But the prime risk—an outbreak of inflation—is simply not a major concern. We are currently just threatening to emerge from a 10-year period of running inflation almost continuously below the Fed’s 2 percent price inflation target. Even if inflation were to drift over this target for a spell of time, the commonly-identified economic costs of having inflation rise from 2 percent to 3 or 4 or even 5 percent are not just low, they’re essentially un-identifiable in the data. In fact, there may well be benefits of making such a shift permanent. 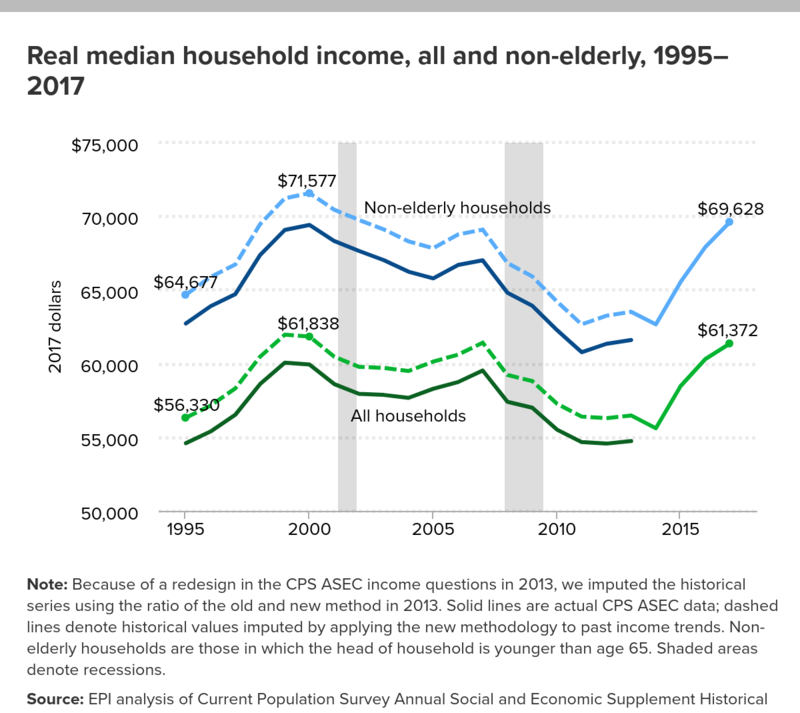 The Fed’s current path largely rules out any aggressive attempt to claw back income losses over the past decade of economic life. 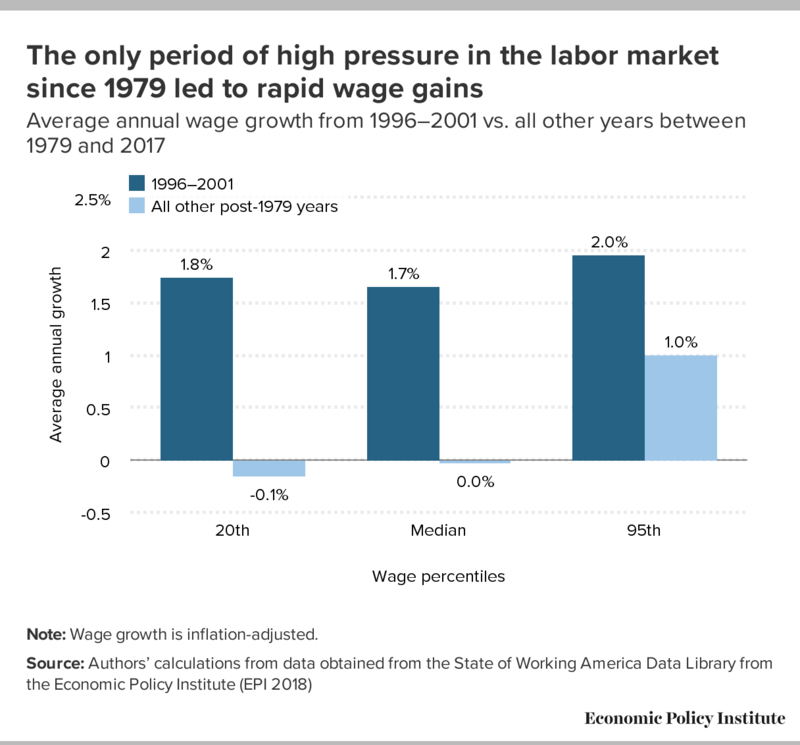 Along the way, it also essentially rules out attempts to make substantial dents in race-based employment gaps, and will do real damage to prospects for wage growth for the vast majority of U.S. workers. The rejoinder that this current path is exactly what we should expect from the Federal Reserve sounds less like a defense of today’s decision, and more like an indictment about its role in generating an economy that has let so much of the gains from growth go to the top and bypass ordinary workers.